Railpictures.ca - James Knott Photo: What was being referred to by the crew itself and RTC as “Work 2319″ is pictured here dropping a healthy cut of grain hoppers for Trillium at Feeder Yard. 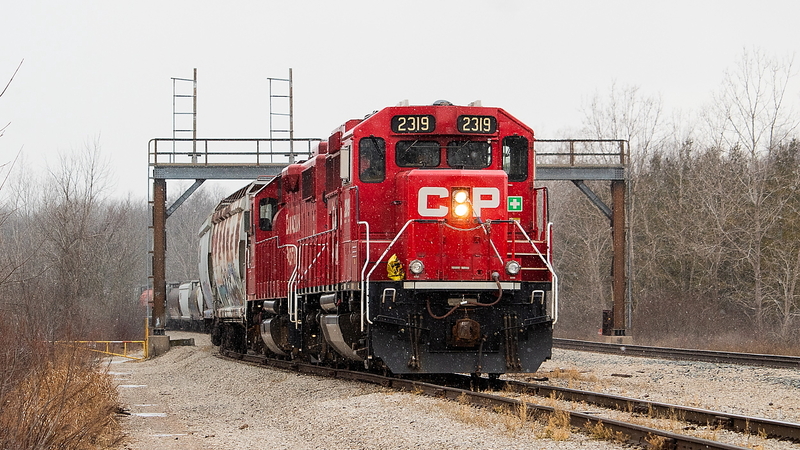 I’m told CP recently had a unit grain train come to the area – all traffic for Port Colborne. From my own observations this day, I believe these cars are going to the old Robin Hood mill. There were hoppers all over the place though – CP Welland Yard, Feeder Yard, WH Yard, and at the Robin Hood mill itself. Things were seemingly busy down at the Grain Terminal and ADM as well with what appeared to be traffic originating off of CN. It was a cold day with incredibly bitter winds that kept bringing with them spurts of blowing snow and flurries, as evidenced in this photo and my previous shot of 564. | Railpictures.ca – Canadian Railway Photography – photographie ferroviaire Canadienne. Caption: What was being referred to by the crew itself and RTC as "Work 2319" is pictured here dropping a healthy cut of grain hoppers for Trillium at Feeder Yard. I came across them working Welland yard with this cut and not long after took off down the Hamilton Sub for Brookfield Siding, and then backed onto the Cayuga Spur into Feeder Yard as shown here. I'm told CP recently had a unit grain train come to the area - all traffic for Port Colborne. From my own observations this day, I believe these cars are going to the old Robin Hood mill. There were CP grain hoppers all over the place though - CP Welland Yard, Feeder Yard, WH Yard, and at the Robin Hood mill itself. Things were seemingly busy down at the Grain Terminal and ADM as well with what appeared to be traffic originating off of CN. It was a cold day with incredibly bitter winds that kept bringing with them spurts of blowing snow and flurries, as evidenced in this photo and my previous shot of 564.